My door panels, stock VW, which were little more than cardboard and vinyl, have somewhat deteriorated in the last 31 years. They just don't make cardboard like they used to... With the new 6x9 speakers that I wanted to install (see thread above), I decided that I'd need something a little more sturdy. So, Dad and I are just wrapping up a 2 full-day long project of making new door panels out of 1/4" plywood. Now, it might not look *too* bad, but by this point Dad and I had already duct taped it back together to use as a template. Great job with the fabrication! Looks good, better than the original. I'm glad to see you didn't paint the new plywood - just staining it keeps a certain honest, utilitarian feel. And it looks good, too. Exactly the right thing to do, IMHO. ___________________- MacManKrisK __ Ohmygosh you drink ROOT BEER. On a saner side it looks awesome. Now the thread jack. If somebody really likes fish how do they handle Friday? Would I have to eat Liver & onions for Friday? That's looking awesome MMKK. Very nice job. do you think your beautiful doors make the rest of the van look a little shabby? I fear this may only be the start. Nice work MMKK. You might want to consider some kind of edging around the plywood to keep it from splintering. But what a difference from before. What did you decide or find out about the body work stuff? I call this photo "Downhill, with a strong tailwind." Um...I really hope that the thing accidentally found its way to that point whilst parked. Otherwise, I hope someone else took that picture! Beyond those worries about safety, that's pretty cool. "The engines cannae take it Cap'n"
Actually, never mind the engines, the brakes in those VW's were never that good. Funny you should say that, I was saying those exact words, with a very similar accent, as I was driving that stretch of highway. I have front disc breaks, and a vacuum-assisted brake booster, thank you very much, and I keep my rear drums well adjusted. It's called muti-tasking, dman. People do it all the time out here. Check their phones, yell at kids, change DVD's, etc. And you know how highly the rest of the country thinks of California drivers. 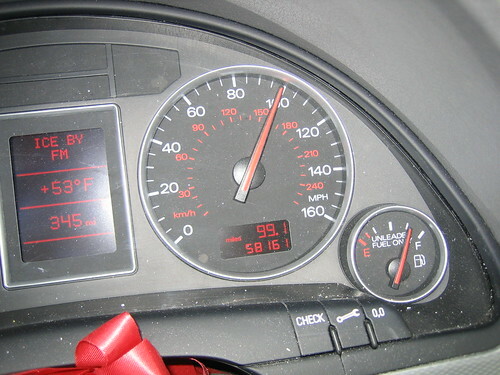 If, by chance, whilst passing a car, or accelerating perhaps too smoothly, I should ever happen to find myself near such a speed, my attention is on the road and /not/ on any other task. But that's just me, and my instinct for self-preservation. YMMV. Sadly enough, yes. This is why the state has wound up enacting legislation such as, do not talk on your cell phone, do not drive around without glass, do not.... blah blah. Stupid people do stupid things. Unfortunately some of those stupid people can't seem to do anything without hurting others. And truly hurting others. Annoying is one thing, pure negligence is a totally different subject. Only 86 m.p.h.? You pansy. With no power steering, and only a 70HP engine, not to mention how top heavy my bus is... you'd've been pissin' your pants at 86MPH! Edit: Duh. Also, really nice job on the door panels. They look great! On the second note: thanks! On the first note... there was a hill a few miles before I took that pic where I got her up to a solid 90, I just couldn't get her up that high again for the pic.